Dr. Balakrishnan’s primary research focus for the past decade has been the growth and characterization of highly mismatched III-Sb compound semiconductors on GaAs and Silicon substrates. 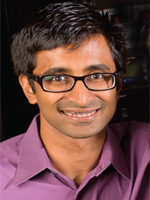 The specific contribution made by Dr. Balakrishnan to this area of research is the novel use of interfacial misfit dislocation arrays in enabling low defect-density, bufferless, monolithic integration of III-Sb on GaAs and Silicon substrates for increased antimonide device functionality on mature platforms. His body of work using molecular beam epitaxy has resulted in over 60 peer-reviewed publications, 30 conference presentations and several patents.